Other leashes can fall into the frame of your shot, but our leash stays coiled and out of view. Leash is approximately 9 inches long unstretched, and 5 feet long when fully stretched. This allows you to pull the GoPro out of your mouth mid-wave for a selfie, while staying secured to your arm. 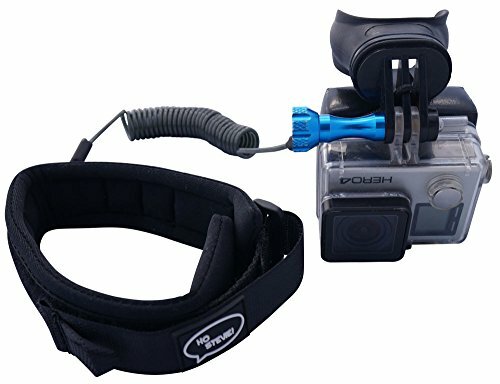 Great for surfing, wakeboarding, or any other time you use a mouth mount with your GoPro. Join thousands of Ho Stevie! fans, and keep your GoPro safe with this armband leash. SECURE YOUR GOPRO - Keep your GoPro and mouth mount safely attached to your arm if they fall out of your mouth during a wipeout. HEAVY DUTY - Steel inner cable provides high strength in the heaviest situations. COMFORTABLE - Soft inner padding keeps the armband secure and comfortable against your arm. 1.5" armband width is slimmer than a bodyboard leash. CLEAR VIEW - Coiled leash stays out of the shot. If you have any questions about this product by Ho Stevie!, contact us by completing and submitting the form below. If you are looking for a specif part number, please include it with your message.